Combine sweet and tangy flavors to make a delicious lemon bar dessert that's so easy, even the kids can help create this delectable treat. My little chef-in-training, Tyler, was given his own apron and kids cookbook for Christmas. We’ve tried a few of the recipes from it so far, including a recipe for Lemon Bars that was absolutely delicious! I usually am not a fan of lemon-based desserts, but I couldn’t get enough of these bars! I can’t believe how simple they are to make, and of course, the boys loved to help with this recipe. According to Tyler, he had to help since it was from his recipe book! Last week, Tyler asked if we could make something from his cookbook, and he wanted to make a dessert. So we looked through the book and found this recipe. He gets so excited to help in the kitchen. He immediately runs to grab his stool, wash his hands, and asks for help putting his apron on. Now and then, Ryan decides he wants to help as well. 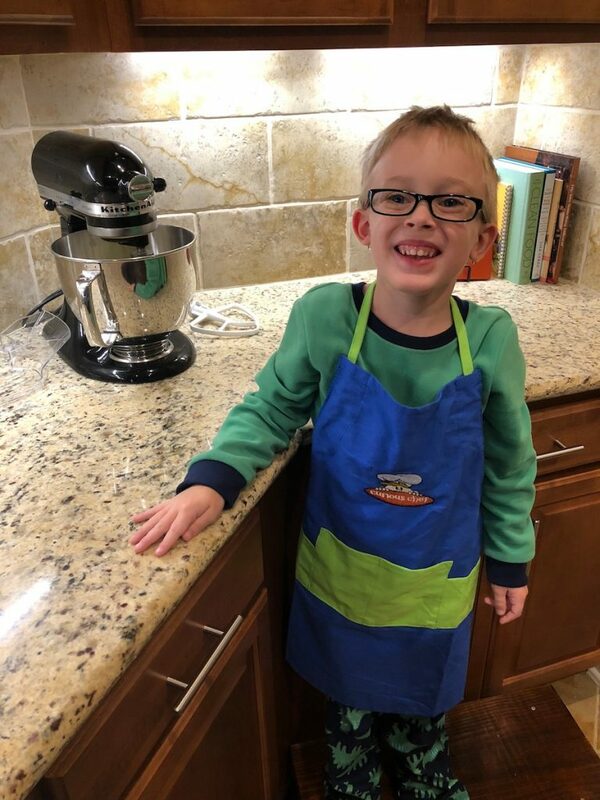 A few days after Christmas, Tyler was so proud to wear his new apron while helping in the kitchen. One of the best aspects of this recipe is the ingredient list. Everything required to make the lemon bars are foods I almost always have on hand. The crust is made of butter, flour, and powdered sugar and the filling is made of eggs, sugar, lemon zest, lemon juice, vanilla, and flour. The only thing I don’t always have is a lemon, but the zest is just extra, and I do make sure to have lemon juice in the refrigerator at all times. Start the recipe by making the crust. Use a mixer to blend 3/4 cup of butter until it becomes fluffy, usually about a minute. You can use a hand-held electric mixer or a stand mixer if you have one. Then add the flour and powdered sugar, mixing until it forms a soft dough. Grease a 9×13 baking pan and then press the dough into the pan. Bake the crust for about 15-20 minutes or until the edges just start to brown. Take it out of the oven and let it cool completely before moving on to the filling. Meanwhile, use a mixer to combine the egg and sugar, then add the lemon zest, lemon juice, and vanilla extract. Tyler has been practicing his egg-cracking skills and getting very good at it. Blend in the flour until it is all combined, scraping the edges as needed. Once the crust is cool, pour the filling into the pan over the crust. Tilt the pan around to make sure the filling covers the crust. Bake the bars for about 25 minutes, until the filling is completely set. After 25 minutes, I used an oven mitt and gave the pan a slight shake. The filling wiggled a little too much, so I left it in for another 5 minutes. After the filling has cooled, cut the bars into small pieces and dust with a bit of powdered sugar. Combine sweet and tangy flavors to make a delicious lemon bar dessert that’s so easy, even the kids can help create this delectable treat. We did have a lot of fun together making these! And they didn’t last long at all. Thank you! They love to be in the kitchen with me. I love all things lemon and this is definitely one of my favorite ways to have it! Your recipe is different from mine though so I am totally going to have to try it and see which I like better! Love that your let your kids pick and help! I’d be interested to hear what the difference is! This came from a kids recipe book, so it’s supposed to be something they can easily do and enjoy. And these boys love to be in the kitchen, especially my oldest son! The boys are so cute, it makes me miss cooking with my son when he was young. I would love to try this recipe…I need to run up and get lemon juice. Thank you! We have a lot of fun in the kitchen together. My oldest especially loves to help, and my youngest just wants to eat everything! It’s great when kids can learn skills and have fun making things. They are adorable, and these lemon bars look amazing! They’d be gone in two seconds in my house! Even before I knew how much they loved helping in the kitchen, I always said I would make sure to teach them at least the basics of the kitchen so they can feed themselves when they are older! And these lemon bars did not last long here either!! These look delicious. I pinned for future reference! Thank you! We loved them and will be making them again soon. The kids did a great job! I’m sure it was a real confidence booster to see you wolf down a lemon-based dessert you wouldn’t normally eat! Teaching kids to cook from a young age is so important. Not only is it an invaluable skill in itself, but it also teaches them to follow directions. We have so much fun together in the kitchen. Sometimes it gets frustrating, but overall, they are learning so much more than just how to cook and I love having them in there with me. This looks so yummy and delicious. I am hungry already. Would be perfect for afternoon teatime. We don’t do teatime here, but my boys enjoy an afternoon snack when they get home from school and they are perfect for it! These bars look so yummy! I know my kids would love them! They were delicious! They didn’t last long at our house at all!! I love the pictures of the kids. They are adorable. And I know I would love this for sure. I am not sure about my daughter, but I know we would have fun making it nevertheless. I’ll have to try it out at least once. Thank you, they love helping in the kitchen. I didn’t think I would like these either, I am not usually a fan of lemon desserts, but they were surprisingly delicious! I think that’s great that they’re easy to make with ingredients most people have already in the home! I’ll have to get my kids in the kitchen to help make these tasty treats… thanks! These are a great recipe to start introducing kids to the kitchen, so much that they can do and it makes a delicious snack! Honestly, I never tried lemon dessert before. These Lemon Bars look absolutely delicous. I’ve had a few that I never cared for, but the boys insisted on making these. It definitely changed my mind about ruling out all lemon desserts! OH my heck. Your little ones are so so darling! But these sounds so amazing!!!! What a fun family activity. Thank you! They have so much fun helping out in the kitchen. And they tend to be more willing to try something if they were able to help make it! aww so cute. I used to make these lemon bars with my sister too. I bet those are some great memories together! Lemon bars are so over looked for their light tart taste. My children grew up helping me in the kitchen. Fun memories. These lemon bars are everything! they look so simple and easy to make too.